The Inogen One G3 portable oxygen concentrator is the smallest and lightest concentrator after INOGEN G4 on the market today. With many of the great features of it’s predecessors, the Inogen One G3 oxygen concentrator is light enough to carry with one hand. A prescription for Oxygen is required. SKU: S15323. Category: Oxygen Concentrator. The long battery life means that you never again have to worry about changing tanks or running out of oxygen when you leave the house. Take your independence back today. 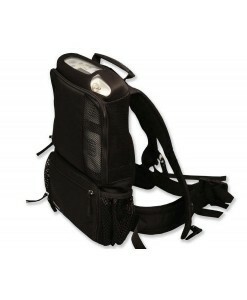 Includes 1 x 8 Cell Rechargeable Lithium Ion Batteries, Carry Bag and Strap, AC Power Supply, Mobile Charger and a Nasal Cannula. Please note that a prescription is required for you to be able to purchase medical oxygen. Hire an Inogen G3 with Oxygen Solutions. Single Battery 4 Hours. Double Battery 8 hours. I would like to thank you and the Inogen One portable oxygen concentrator for changing Mum’s life. Five years ago Mum’s health got to the point where she needed to be on oxygen 24 hours a day. We already owned a home oxygen concentrator but what was mum to do about leaving the house? Despite Mum’s reservations we had someone come to the house to show us the various oxygen bottles Mum could use when leaving the house. But these cylinders were bulky and looked like something out of a hospital ward. They could only be used for a short period of time before needing to be refilled, and Mum would have to plan every outing to make sure she never ran out of oxygen. What a nightmare! Spontaneity would go out the window and a lot of driving to and from the store would have to be done to replace the cylinders, or we would have to pay for a costly delivery service. So this wasn’t going to work and we sent the person away. Mum was very upset because she couldn’t see a way forward and began to contemplate a life trapped at home attached to her home oxygen concentrator. Then one day, Mum spotted an advertisement by Independent Living Specialists for the Inogen One and her life changed forever. Mum loved the modern sleek design of the Inogen One right from the start and it gave her a new lease on life. Everywhere we went people would ask where they could get one for their mum or dad or even for themselves/ Ever since we’ve become unofficial ambassadors for the Inogen One singing its praises everywhere we went, even handing out brochures in the waiting room of Mum’s respiratory Specialists. The Inogen One is incredibly reliable and has never let Mum down. It also has cabling for the car for those longer trips away. Last month, we came in and met with you again and traded in the Inogen One G1 for the new tiny and even more portable Inogen One G3. Mum was glowing when we walked out of your store and it was great to see her getting in and out of the car on her own without needing any help. The new Inogen One G3 has opened up so many more opportunities for Mum to get out and about because she can carry it like a handbag instead of dragging it behind her on a trolley. She can now access stairs on her own without needing someone to carry the more bulkier G1 up and down for her. This has given Mum an entire new level of independence and a huge confidence boost as the Inogen One G3 is much more compact and discrete.